Which team removed Disks menu? Why was menu removed from Disks? On Mint 19 xfce, my gnome-disk-utility is missing upper-left menu. I was able to restore it with Window Manager. Question: was this an xfce-team decision? gnome-team decision? Or mint-team decision? i'm not running either of those. I checked Xfce after op's report and verified the UL menu button is not visible by default. Good grief--why would anybody not want that menu functionality? Thx, so this was a Mint decision? btw, this is not a criticism of Mint team! Mint rocks. gnome support was confused by this. your report. I was pleased to see you found the method to show the icon. As I said--I don't understand why anyone would prefer this hidden? but more likely it's from upstream - - Ubuntu, most likely. how to determine if this came from Mint or Ubuntu? this is a general xfce setting, and i'm guessing Mint team prepared Mint xfce, not Ubuntu. Yay, for people making assumptions. I don't remember this ever even being brought up in the Mint team. Mostly likely it was some sort of oversight. We went through a beta and the release has now been out for a bit and this is the first I ever remember hearing of this issue. Yay, for people making assumptions. I don't remember this ever even being brought up in the Mint team. Mostly likely it was some sort of oversight. You could take it as a compliment... people consider Mint devs to be so 1337 / professional that they never ever make mistakes and oversights are not a thing that happens! If I understand it right, the icon in the upper left hand corner of the (Disks) application window is the "system" menu. It seems to me that on some DE's this system menu is disabled by default; on some it is enabled by default. Not sure whether some elaborate plan is behind it. In the Disks application this system menu is modified by the application itself. This, too, is the reason why the icon is not the same as in other applications which do not modify the "system" menu. By the way, on Xubuntu 18.04 (corresponds to Mint 19 xfce) the system menu is enabled by default and the Disks application displays its modified system menu icon and therefore the menu as well. Sorry, cannot illustrate my convoluted statements with screenshots, because I am logged in on a (uhm) Windows 7 system. Anyway, enabling the system menu can be done through System Settings. It will affect all applications, not just Gnome Disks, of course. because I am logged in on a (uhm) Windows 7 system. That menu is called the Appmenu in Gnome terms. In gnome shell it is moved from the applications titlebar to the top panel. Outside of Gnome shell it's supposed to display in the apps header bar. Different DE's handle this in different ways. It's not the same as the "menu" you get in a normal server side decorated window. That menu is supplied by your window manager. The one shown in gnome-disks it supplied by the app as are the window decorations. It seems many DE's are determining whether or not they show this based on the setting for what is shown in normal window manager decorated windows. Fortunately this is a decision that Gnome looks to be going back on and just making that menu part of the app and dropping the whole Appmenu idea. I admit I shamelessly applied the Windows term "system menu" to Linux Mint. Thanks, JosephM, for explaining the details, which I had ignored, not really understood. hi Mint team, this post wasn't intended to accuse or blame. easy enuf to re-add the icon with Window Manager. But maybe a good idea to include it by default, since Disks has some functionality which seems inaccessible otherwise. Maybe true of other gnome apps. Many Thanks Mint team for an awesome Linux!! This only affects Linux Mint 19 Xfce and practically only programs using a GTK3 headerbar, which puts functionality in the menu. This is a window manager user preference. 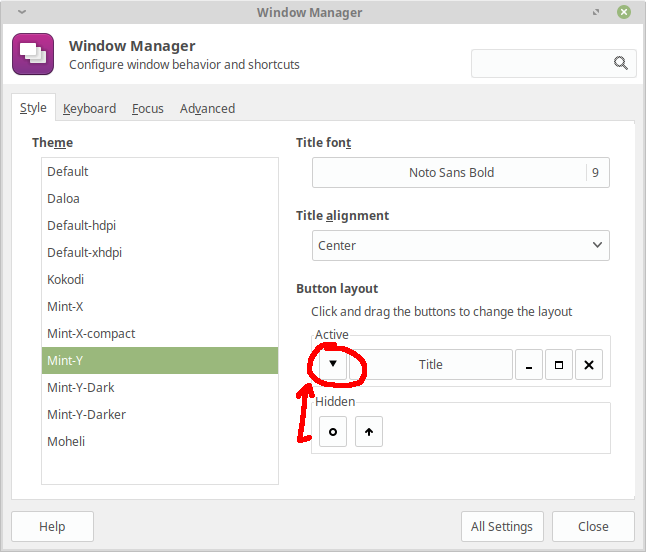 The user preference default is changed for Linux Mint 19.1 Xfce (due around November/December). As it is a user preference, if you upgrade Linux Mint 19 Xfce in place to 19.1 this user preference won't be changed for existing user accounts. Package updates can't change files in home directories they can only put in place new template files to be used for when a new user account is created later.